Sinkholes in Seffner, Fort Myers, Tallahassee, and now even closer. 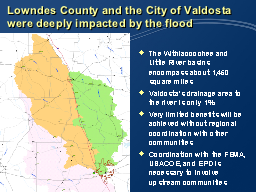 Follow the Withlacoochee River south to the Suwannee River, and two counties south of us in Suwannee County, Florida, they've got dozens of sinkholes, one of them massive, with another one this month, including apparently a cavern under some yards. This is in the same Floridan Aquifer that underlies Lowndes County, where we had a road drop into a sinkhole three years ago and sinkholes were discovered under a man's garage and yard last year. Mikell Cook says he and his neighbors have learned more about Geology than they ever cared to since last summer when Tropical Storm Debby swept through much of Florida leaving Live Oak and surrounding areas peppered with sinkholes. Even closer than Tampa Bay or Fort Myers, Tallahassee has sinkhole problems in our same Floridan Aquifer just across the state line. Will the Lowndes County Commission do anything about our sinkhole problems before people start losing their insurance and get sucked into holes in the ground? Imagine living in a home you can't insure, no one wants to buy and it may not be safe. A Tallahassee woman is currently facing that problem. At first glance, her home in Tallahassee's Mission Manor neighborhood on the city's northwest side doesn't look much different from any of the other homes in the neighborhood. Then about two years ago, homeowner Vickie Gordon found a problem. "I started noticing that the doors were getting stuck in the bathroom, couldn't open them," said Gordon. Then the issues became more noticeable. Cracks started showing up all over the house. After Gordon contacted her insurance company, investigators found sinkhole activity at her home. Hearing a representative was in town, Gretchen took the LAKE video camera down to the Chamber of Commerce. Greg Gullberg of WCTV invited her to rebut Rep. Austin Scott (R GA-08) in her role as Chair of the Lowndes County Democratic Party (LCDP). After some back and forth, the WCTV story shows transparency winning, and Gretchen with the last word. But their [sic] is one thing they both agree on. "I quite honestly think both sides ought to put their budgets on C-Span and maybe we ought to have those negotiations on C-Span," said Scott. "So I'm all for having everything all out on the table for all citizens to see," said Quarterman. Hey, what if the Lowndes County Commission put its board packets and budgets out on the web for all us taxpayers to see? Here's the WCTV video. The video Gretchen took will follow. Hardly-funded insurgents led by Haley Shank put a scare into turncoat south Georgia statehouse incumbents. What would happen with well-funded candidates? Conversely, Jason Shaw (R-176) ran unopposed, perhaps because he is the least offensive of the incumbents (he voted against HB 1162 that put the Atlanta-power-grab "charter school" amendment on the ballot, although he did vote for HB 797 that will funnel more of your local tax dollars to charter schools imposed by Atlanta even if your school board doesn't want them). Other south Georgia statehouse incumbents, all Republicans, had challengers, all Democrats. All the challengers opposed Amendment 1. Haley Shank did best, in District 173 against Darlene K. Taylor, 8,324 to 12,048 (40.86% to 59.14%).